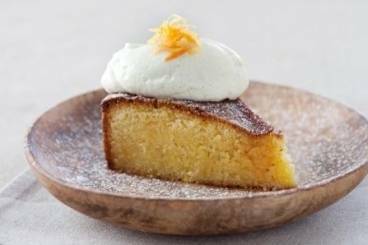 Crumbly gluten free, orange polenta cake with sweet vanilla mascarpone and a Cointreau drizzle. Scrape the seeds from the vanilla pod. Zest 1 orange and then juice the remaining oranges until you have 50 millilitres of orange juice. Beat the butter and sugar together until pale and light. Stir in the ground almonds and vanilla seeds. Beat in the eggs, one by one. Fold in the orange juice and zest, the polenta and the baking powder. Pour the mixture into individual silicon moulds and bake for 20 minutes until golden. Boil the cointreau, water and sugar together until syrupy. Place the cake in the centre of the plate, drizzle with the cointreau syrup and make a neat quenelle of mascarpone on top.